Dave and I love Niagara Falls, Canada. Ever since we first met, we always made time for a weekend getaway to Niagara. But we never thought of taking the bus there. So when Busbud asked us if we'd like to take a bus trip to anywhere in North America, we chose the Toronto to Niagara Falls bus. We go to Niagara Falls regularly by but not everyone has a car, especially people traveling from out of the country. 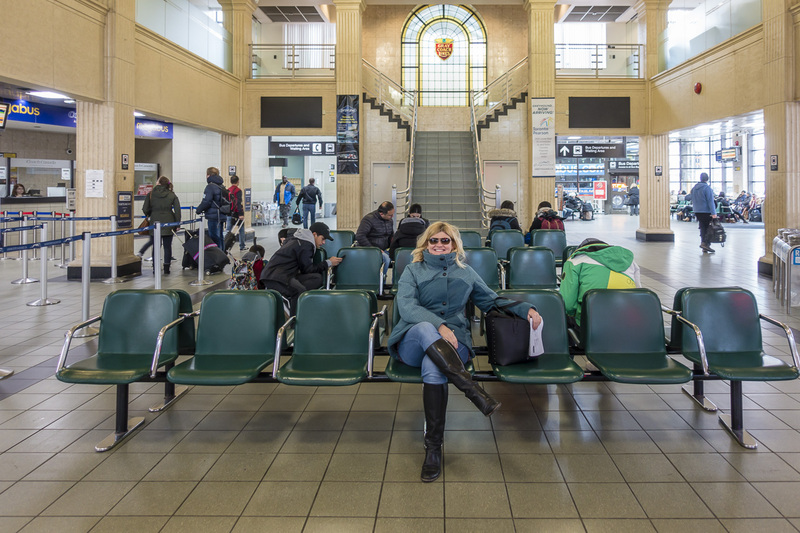 So we want to share the experience of how to get to Niagara from Toronto for tourists and visitors to our city. 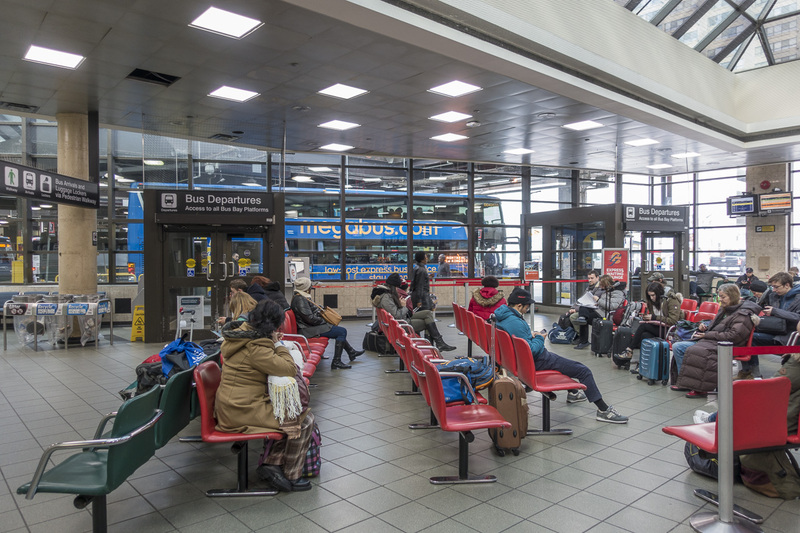 The bus terminal in Toronto is centrally located at Bay and Dundas one block from Dundas Square and the Eaton Centre at 610 Bay Street. Buses leave throughout the day starting at 6:00 am. 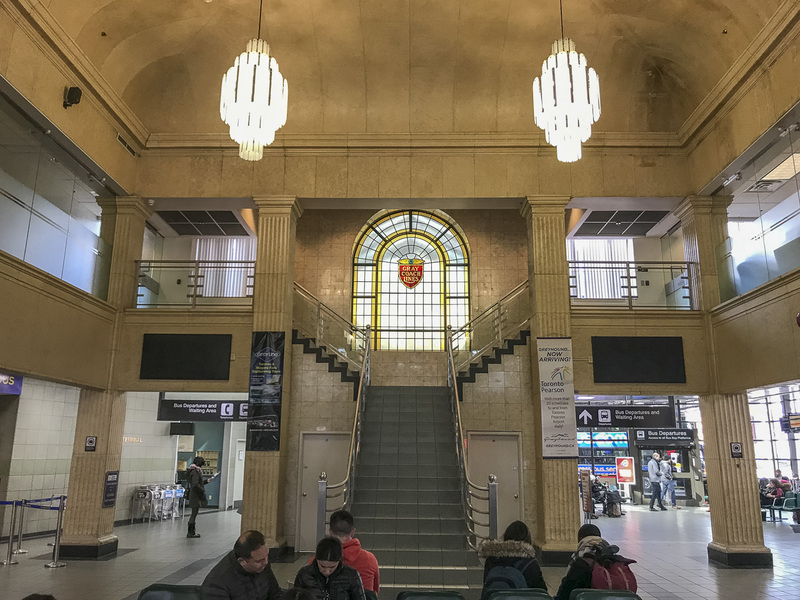 If you are on a short visit to the city, you can hop on an early bus to Niagara, spend the day sightseeing and head back to Toronto on the 11 pm bus. You wouldn't even have to change hotels. 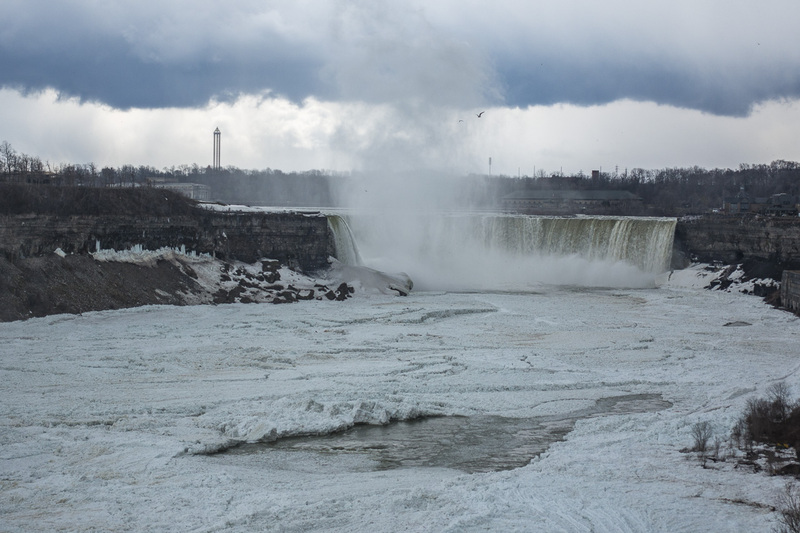 We highly recommend traveling to Niagara Falls independently when visiting Toronto. 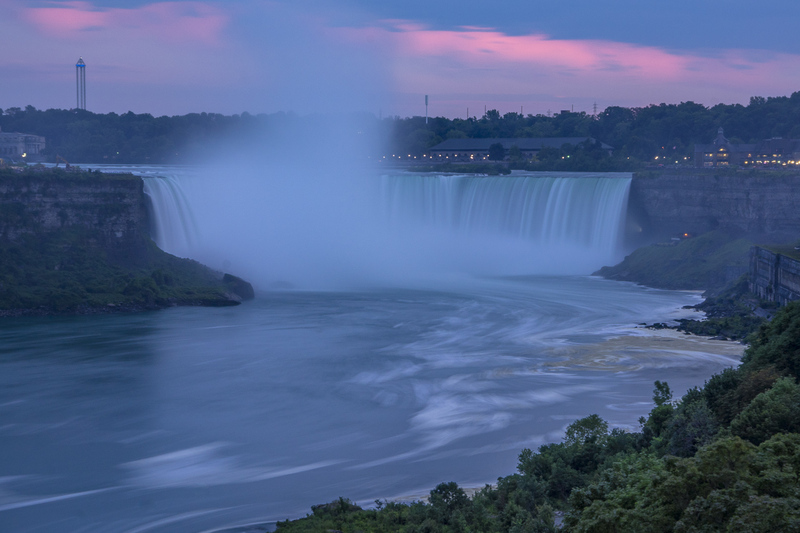 There are many tour companies that you can book day trips with from Toronto, but Niagara Falls is really easy to get around on your own. 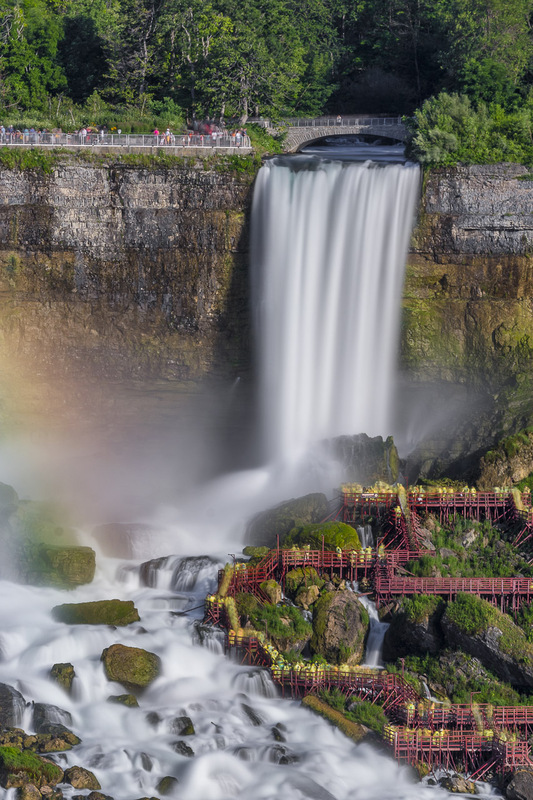 There are several attractions passes to choose from in Niagara Falls. 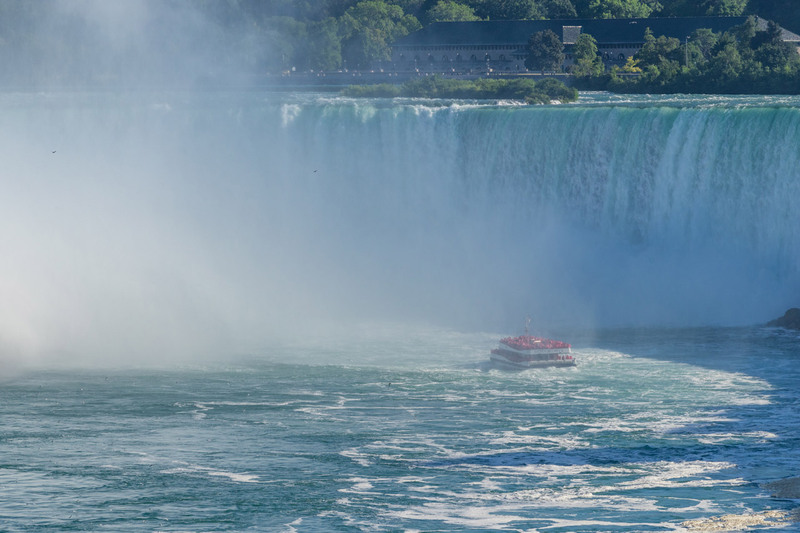 For a flat fee, they grant access to all the major attractions like the Hornblower boat that takes you right into the heart of Horseshoe Falls, Journey Behind the Falls, Whitewater Walk and access to the WEGO bus that stops at all the major attractions. Why take a tour when you can hop on a bus and be in Niagara Falls in less than two hours to start your day of fun? 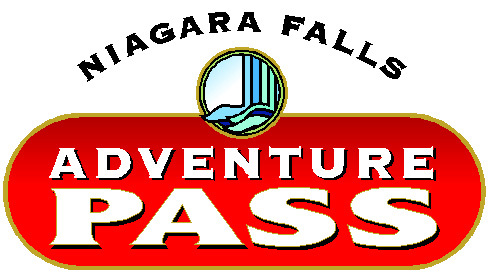 You can buy an Adventure Pass through Niagara Parks in advance for deep discounts. It can be used anytime in the year you buy it. 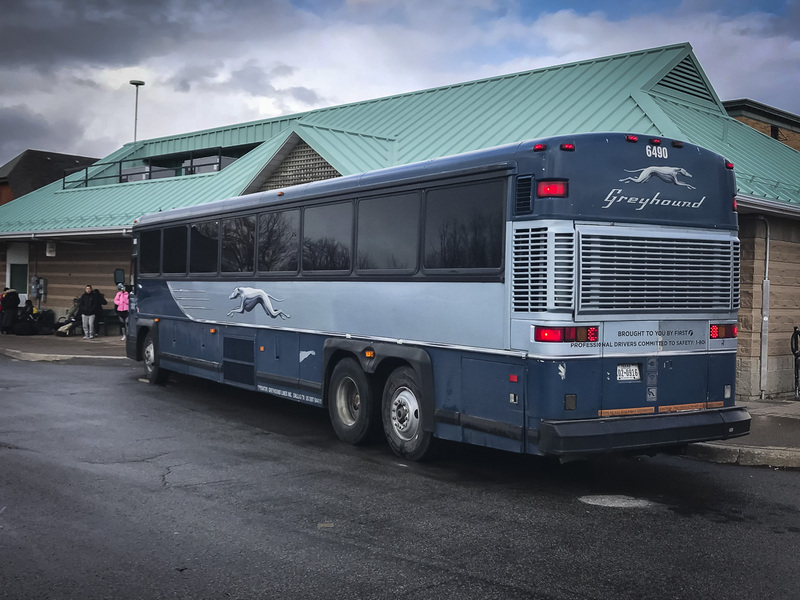 The Greyhound buses that commute between Toronto and Niagara have definitely seen better days. This is a short trip, so don't expect the beautiful mega busses you've with TVs and plush seats. It's bare bones. Albeit our bus was are equipped with Wifi. Seats are not pre-selected. It is first-come-first-serve. Arrive at least 20 minutes early as they will most likely start boarding 15 minutes before departure. Be prepared to move the minute they announce the bus is ready for boarding. Or if you are allowed, go line up beside the bus on the boarding dock. There are monitors in the building telling you which dock your bus will be boarding from. We were number 7. Lesson Learned: When leaving, Dave and I sat taking photographs and doing Instagram stories thinking we had all the time in the world. When we waltzed out to the bus 10 minutes before our departure, everyone had already boarded and we narrowly managed to get a seat together. We sat right at the front of the bus and we would have preferred somewhere in the middle. Had we boarded earlier we could have had our choice of seats. The terminal has a seating area and a convenience store. We stocked up with water and snacks for the ride there. It's reasonably priced so you don't have to scout out other stores if you are looking for a snack. 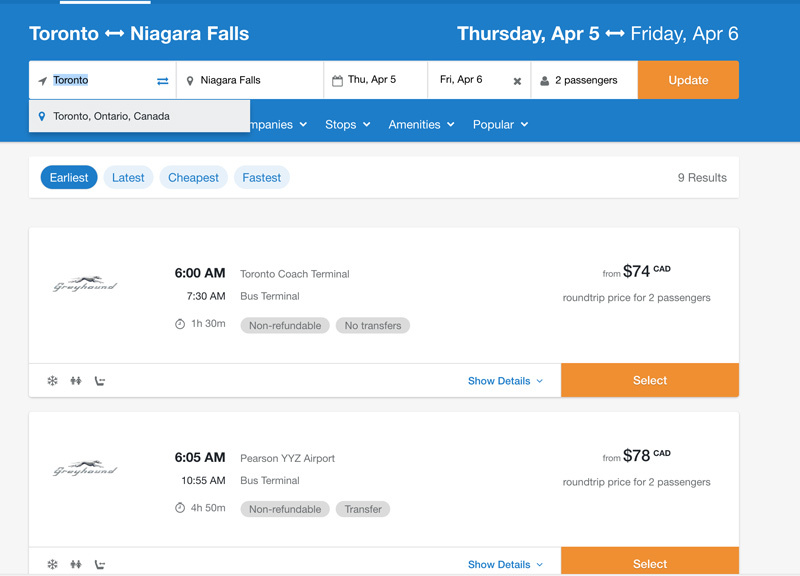 You can book buses from Toronto to Niagara Falls return quick and easy through the Busbud booking site. The bus arrived at the downtown terminal in Niagara Falls. Don't let this fool you. Downtown Niagara is not downtown near the hotels and attractions. 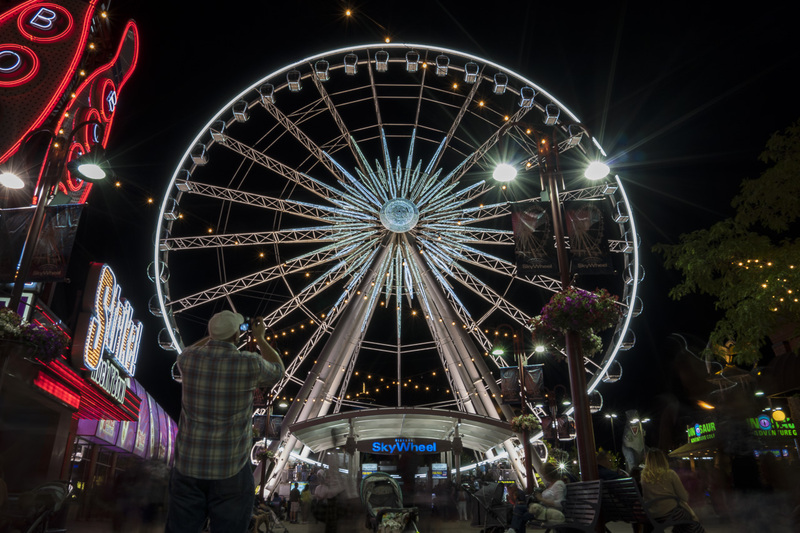 It's a 30 minute walk to Clifton Hill. If it is a nice day you can walk along the Niagara Parkway that takes you along the river. But the more direct route is to turn right when you leave the terminal and keep on walking until you get to Clifton Hill. 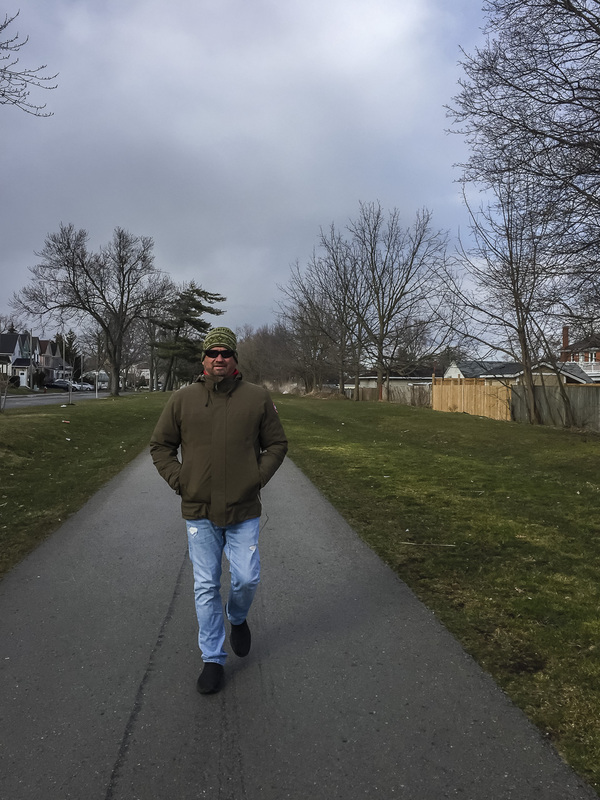 It's an easy straightforward walk with pedestrian paths through the park. There are taxis waiting outside too or you can easily call an Uber. The great thing about taking the bus is you can enjoy a beer or two throughout the day and not have to worry about driving home later in the night. You don't have to go back to Toronto right away either. You can book as many nights as you want in Niagara Falls and book your bus ticket back whenever you like. Fares are the same regardless of return or one way. But you can easily see a lot in a day in Niagara. When you arrive, head down to the Falls at the base of Clifton Hill near the Sheridan Niagara and find a tourist information booth. They sell attractions tickets directly here. 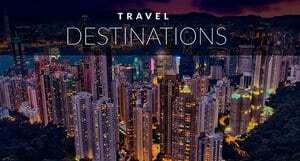 Or better yet, book them online and then you can start sightseeing right away! Before the crowds arrive, we suggest doing the big ticket items ASAP. The Hornblower always has huge lines, so if you get on when it opens at 8:30 am, you'll most likely beat the rush and not have to deal with the giant crowds that arrive later in the day. You can then either walk, catch the WEGO or even zip line to the Journey Behind the Falls. We love this attraction. It takes you through tunnels behind Niagara Falls where you see and feel its power. You can walk right out through tunnels leading to the cascade and see the massive amounts of water pouring over the Niagara River. This is another attraction that has huge lines, so get this out of the way as early as possible. Once you've done these two attractions that are included in your attractions package, you'll have the rest of the day to sightsee at leisure. It is worth it to take the Toronto to Niagara Falls bus just to see this! But before you leave, make sure to go up to the Grand View Market Place. This is the spot where you've seen all those beautiful pictures of Horseshoe Falls from above. From Journey Behind the Falls, you can decide to go anywhere. If you want a break from attractions, take the incline railway up to the casino area. Here there are a lot of choices for lunch from Tony Roma's, The Outback and the Keg to small cafés in the food court. 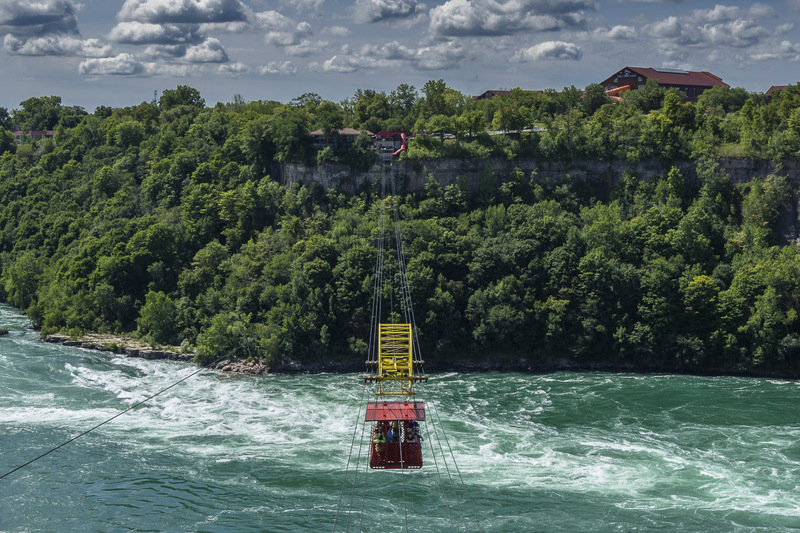 The rest of the afternoon can be spent using the rest of your Niagara Falls Adventure Pass to experience the 4D attraction Niagara's Fury on one side of town to going on the Whitewater Walk on the other. Don't worry, the WEGO bus will take you wherever you need to go! 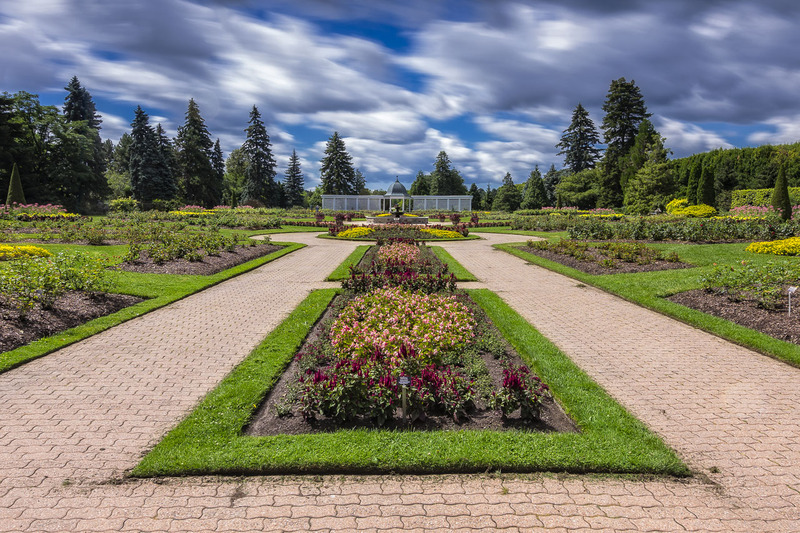 If you have more time, we suggest visiting the Butterfly Conservatory and doing either the Whirlpool cable car or Whirlpool Jetboat out of Niagara on the Lake located about 20 minutes from Niagara Falls up the Niagara Parkway. 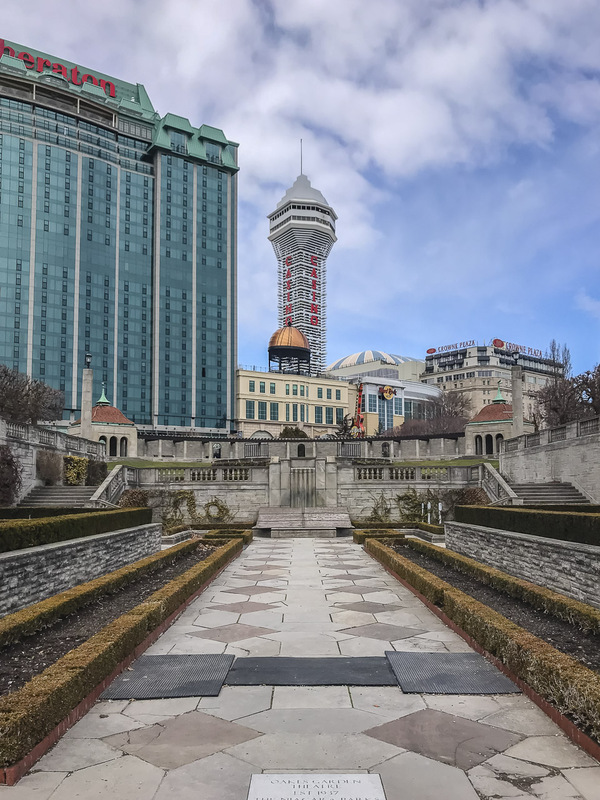 After you've done all these attractions, you've witnessed the bulk of Niagara Falls activities and now it is time to enjoy the town. A walk on Clifton Hill transports you back in time to the 1970s where kitsch was in full force. 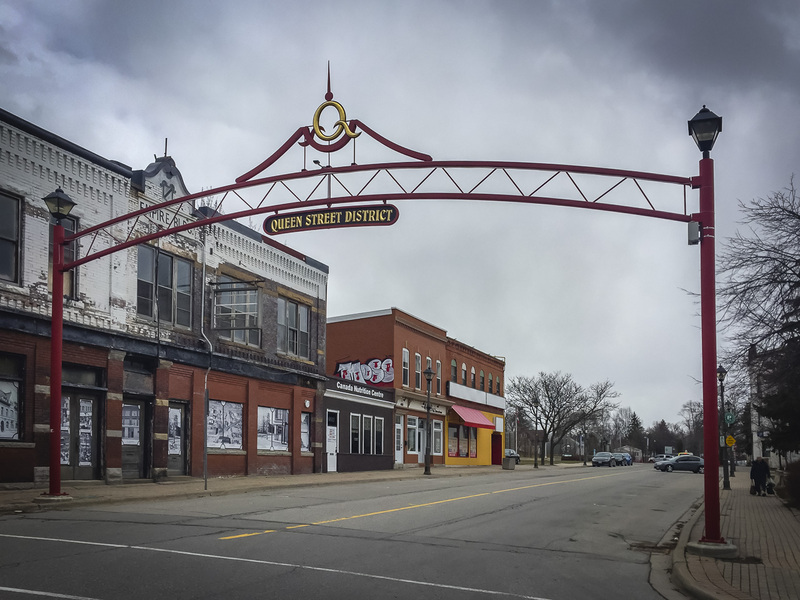 It's a street lined with wax museums, haunted houses, fast food diners and a complete midway including ferris wheel. You can buy an attractions pass for as low as $29 for the Clifton Hill area so if you want to pop into a few fun houses for the afternoon, it's a lot of fun. 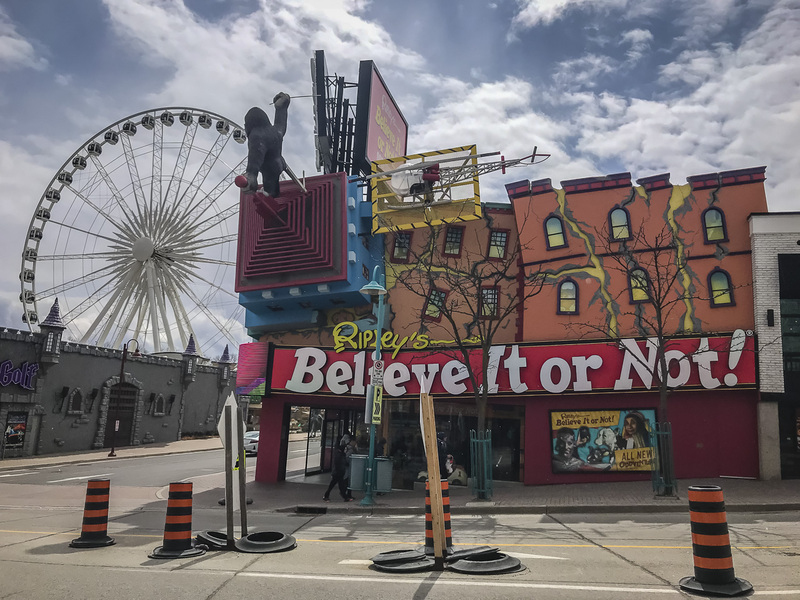 If you want a real scare, walk up to the end of the street by Ripley's Believe it or Not and turn right. 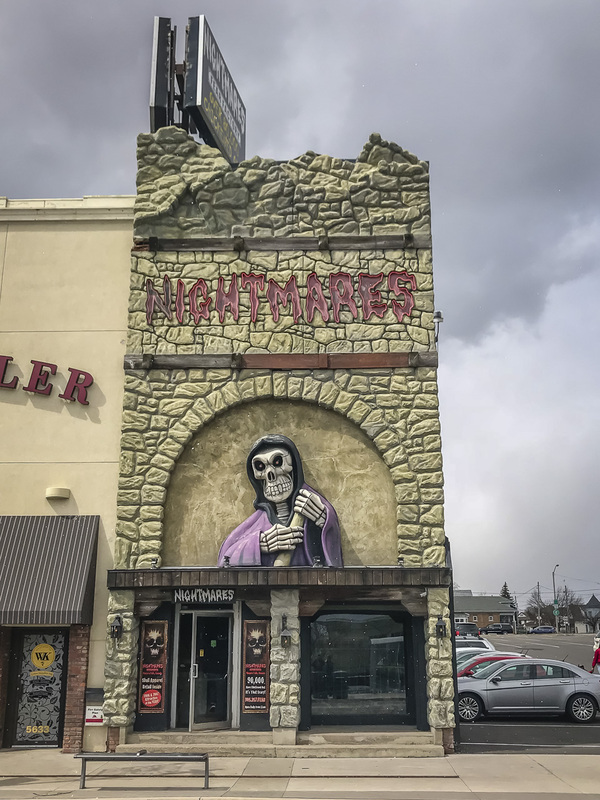 Nightmares Fear Factory is located here and more than 130k people have chickened in the middle of the experience. 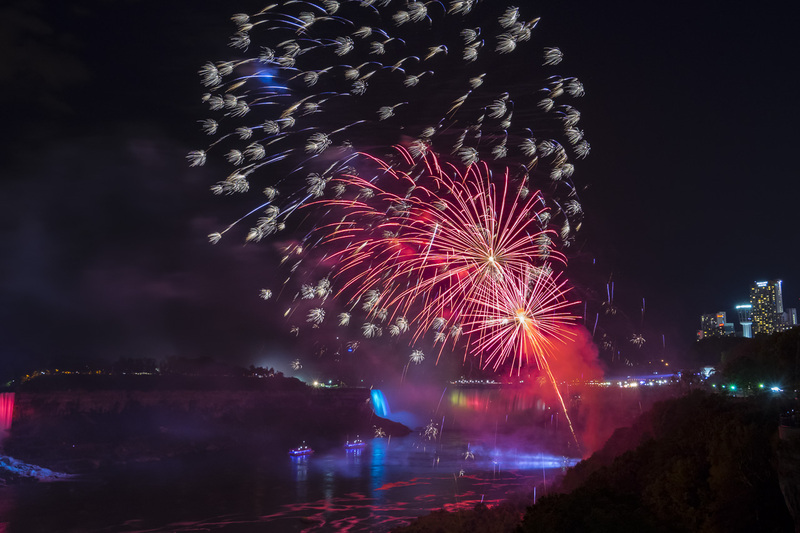 If you are going to do one cheesy thing in Niagara Falls, we suggest this! So, you've booked the 11 pm bus back to Toronto from Niagara Falls and it's only 6 pm. What else can you do? 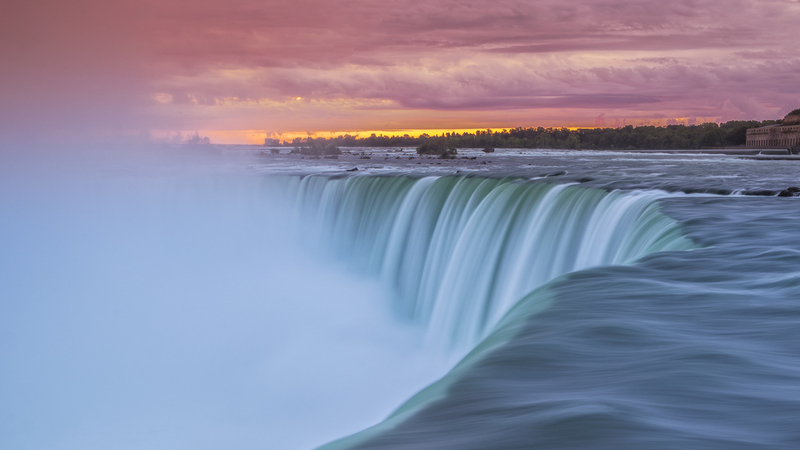 Niagara Falls has come a long way baby and there are plenty of things to keep you occupied. Niagara Falls has two Casinos. One at the Base of Clifton Hill and one overlooking Horseshoe Falls. Casino Niagara at Clifton Hill inside the Sheraton is what we put in the “For die-hard gambler's” category. There isn't much else to do there but hit the tables or slots. 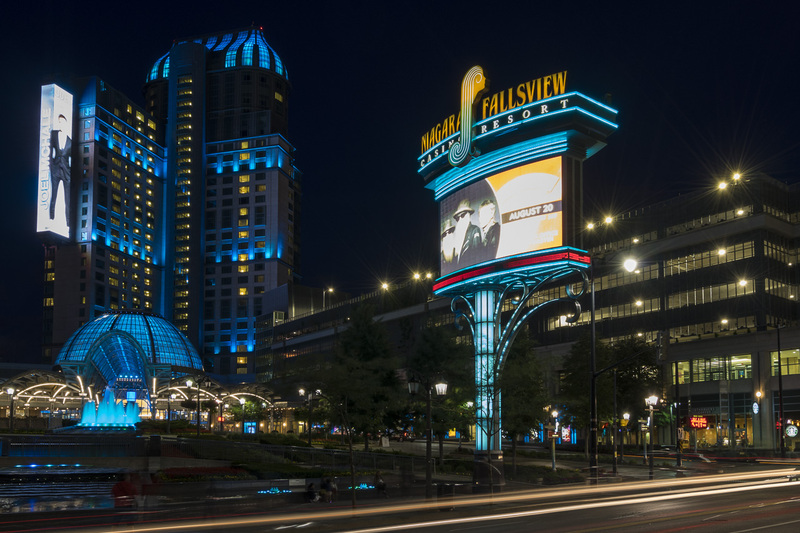 Fallsview Casino Resort in the Fallsview tourist area is for families and people who want to give gambling a shot but aren't going to spend the entire night betting their money away. There are several great dining options that overlook the falls. One of our favorite places is to go to the top of the Tower Hotel at Marilyn's Bistro. 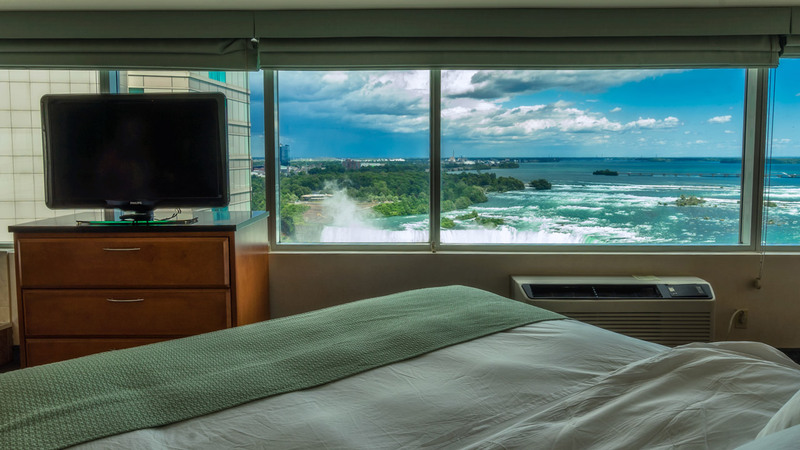 You'll have live music, dinner and a panoramic view of the Falls. The Keg Restaurant in the Marriott has a beautiful of the falls as well. Fallsview Resort also has live entertainment that starts at 7:00 and 8:00 pm giving you enough time after the show to catch a cab back to the bus station. 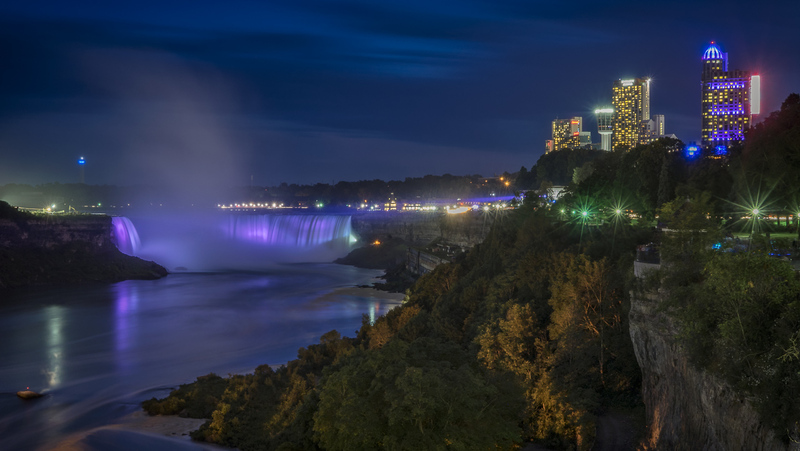 In the summer Niagara has a light show over the falls at sunset and afterwards, you can choose from countless restaurants to go for dinner. Niagara Falls has music venues, comedy clubs, and even magic shows. You'll have plenty of options once the sun goes down to keep you busy. When the day is over, grab an Uber back to the bus station. We don't recommend walking back, instead take a taxi or Uber. Just like Toronto, arrive early so you can get the seats you prefer. When we got to the bus station the place was packed. There wasn't a seat for us to sit in the waiting room, but it worked out best for us because we stood by the door instead. Once they started boarding the bus, we were first on because we were right at the exit. We had our pick of seats. We settled in and had a nap all the way back to Toronto. 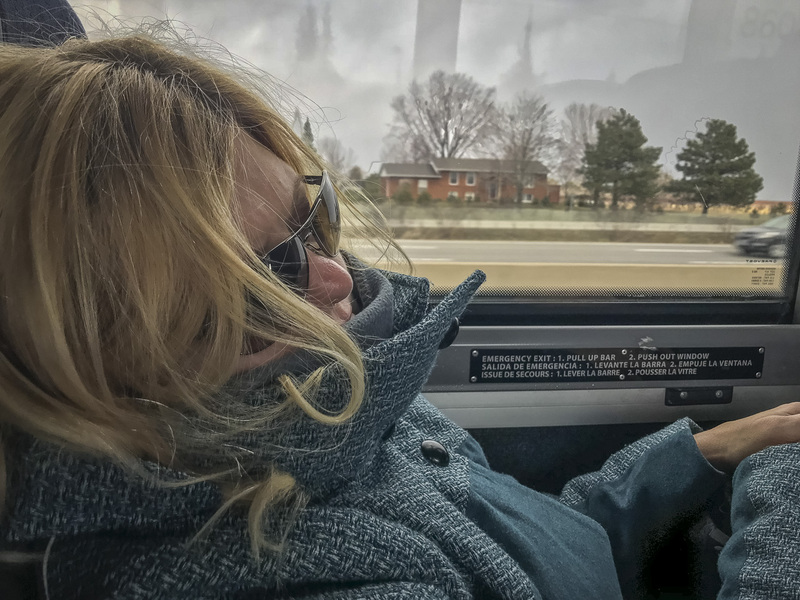 The bus dropped us off at Bay and Dundas and we took the quick subway ride home to sleep and dream about the Mighty Niagara Falls. Busbud is the leading booking website and travel app for bus travel between cities worldwide. It allows customers to search, compare and book bus travel in 75 countries. It was super easy to book through Busbud. All we did was go to their website, type in the city we wanted to travel to and the city of departure and Busbud searched prices and times for us. Visit Busbud to book your own bus trip anywhere around the world. It showed us price options, times of departure and we could even check the options earliest and latest bus departures. If we wanted to stay over in Niagara Falls, we could search right in the app. Busbud searches 6 different hotel booking sites to help you find the best deal in the city you are traveling to. 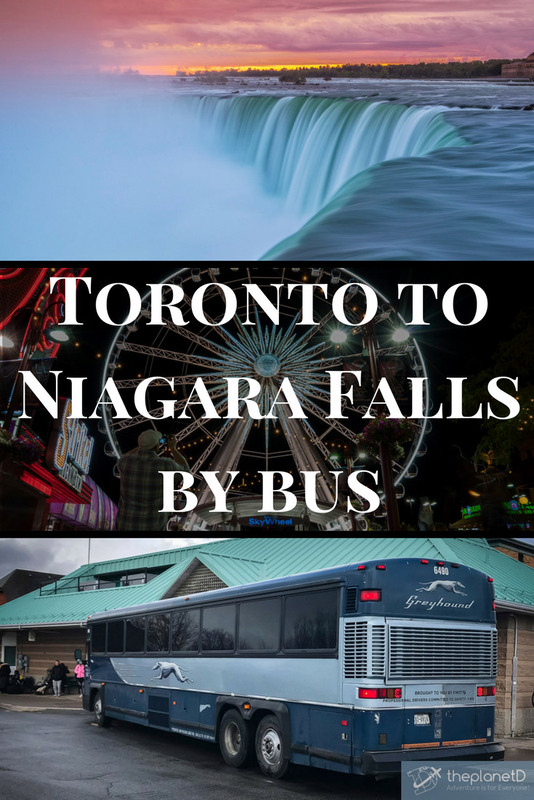 Traveling from Toronto to Niagara Falls by bus is super easy. 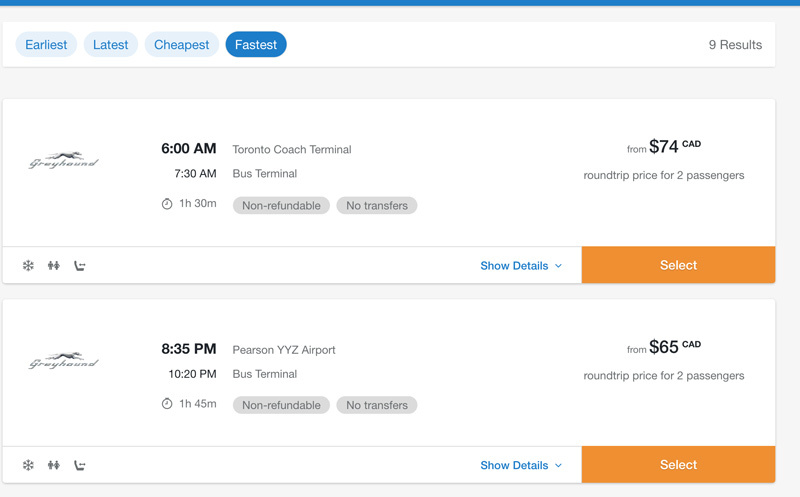 We booked a few days in advance, but on Busbud you can book even the same day. If there are seats available it will find it. We chose our date and times for departure and return, selected our tickets and paid online. When purchasing tickets you have the option of either printing out your tickets at home or picking them up at the bus station. They tell you to have I.D. to accompany your ticket. Nobody asked us for ID but we do suggest you always have ID on you. You could easily be denied boarding. When you arrive at the station either go to the counter to pick up your ticket or if you printed your ticket, go directly to the bus with ticket in hand and I.D ready. To find your bus, check the monitors to see which platform your bus is parked on. It's that easy. You are done! 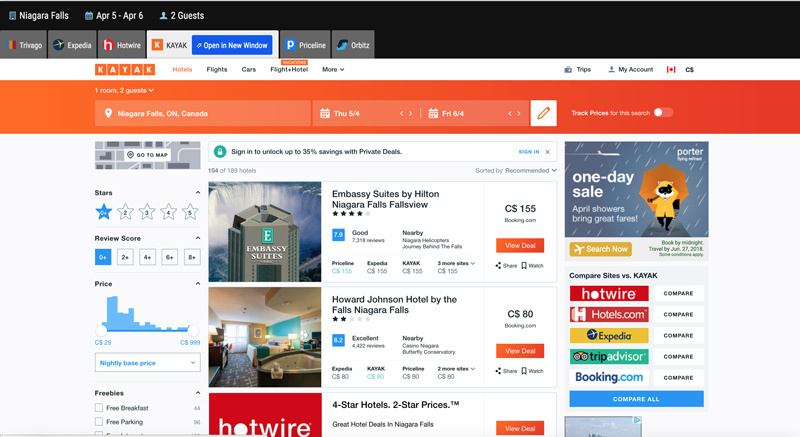 To book your bus from Toronto to Niagara Falls or anywhere in the world visit Busbud for online bookings. Disclosure: This post is in partnership with Busbud. 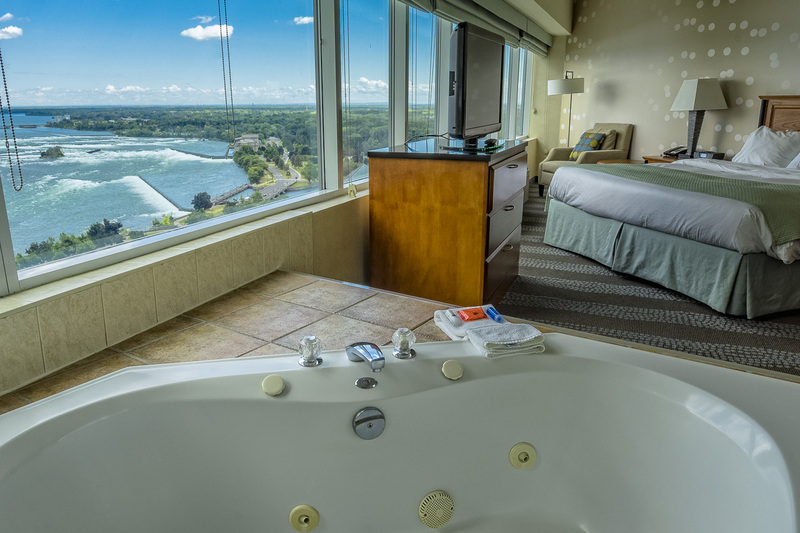 As in all cases, all views of the booking process, Niagara Falls, and the experience are our own. 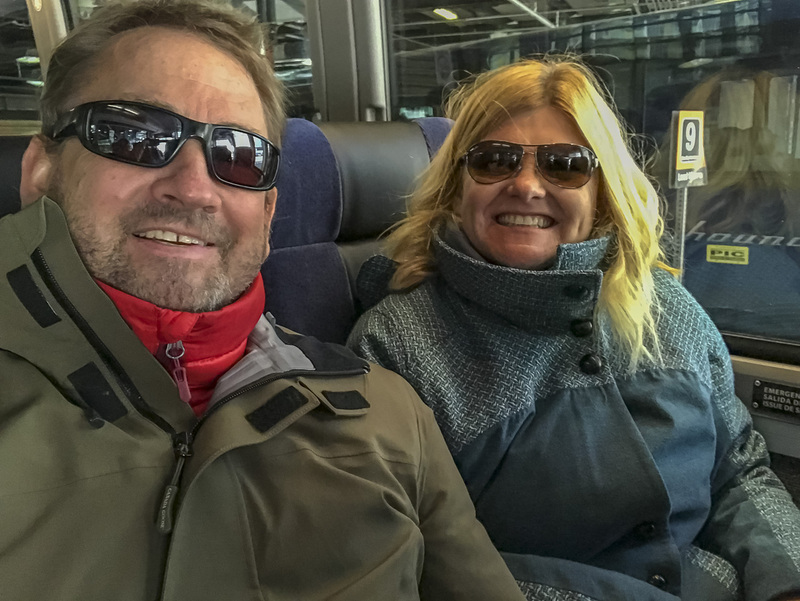 3 Responses to "Toronto to Niagara Falls by Bus -It’s Easy with Busbud"
I loved your post! I’ll travel to Toronto in a few months and I’m planning to go to Niagara Falls. You solved all my doubts, thank you so much for sharing all the information. 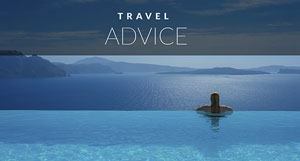 Great post, just what I needed as I am planning one day at the Niagara falls early in August. The problem is that I want to do it independently by bus and so far (even with the company you recommend, I haven’t found a bus that departs after the night fireworks (which is the main activity I want to do in there, going by boat). No buses at 11 pm, I checked all the possible combinations, so I think I will have to rely on an organized tour. Nothing bad about them but I like to be on my own and travel independently as much as I can. Thanks for the tips, it’s my first time in there and I want to stay the whole day, let’s see if I can find a way around my timetable issue, not giving up just yet! 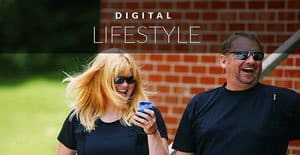 Awesome post along with relevant article and photographs. Niagara Falls is an exotic destination. I wish I could travel like to you. Thanks a lot for sharing this amazing post. 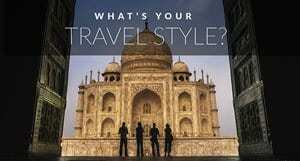 It is suitable for all those travelers who pursue weekend getaway.